②I have one brother and one sister. ④I have breakfast every day. ⑤I have coffee every morning. ⑥I have a headache today. ⑦I have an English lesson today. 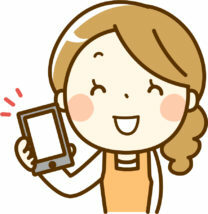 ①Akiko has a new mobile phone. ②My mum has a headache. aが付くので注意してくださいね。「風邪をひいている」という時もI have a cold. 「熱がある」と言う時も I have a fever. ③My friend has two dogs. ④My boss has lunch at a restaurant everyday. ⑤She has a good heart.